What is a labyrinth? 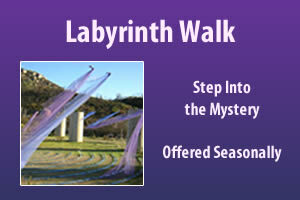 A labyrinth is a sacred geometrical symbol with a single path leading to a center point. It is not a maze because there is only one path. Its unique pattern is designed to shift awareness from left brain to right brain as you walk, inducing altered states of consciousness. It allows those who enter to experience other ways of “seeing.” The center point is the place of power. In a most basic sense, the labyrinth represents the spiritual journey; that of venturing to the center of your innermost being and then returning to the world with a broader sense of who you are. It is a metaphor for life’s journey. Inherent within the design of thelabyrinth is its archetypical power, dating back some 3,000 to 4,000 years.